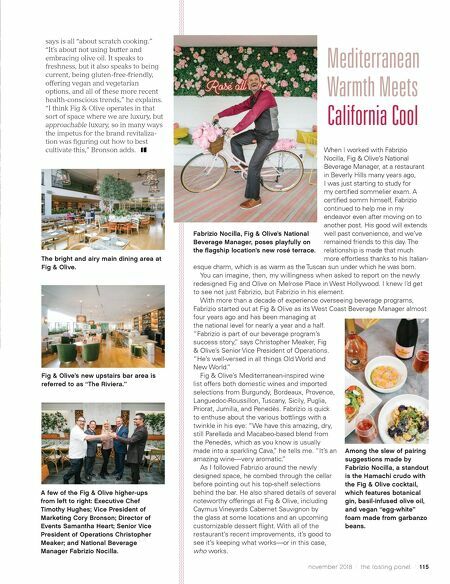 1 14 / the tasting panel / november 2018 HOT PROPERTY I t's not like you couldn't have rosé all day before at Fig & Olive in West Hollywood, but with the addition of the restaurant's outdoor "rosé terrace," it's become harder than ever to resist. Bejeweled with pink roses, the feature serves as the very Instagrammable face of Fig & Olive's exhaustive redesign. At a VIP relaunch party in July, DJ Jason Bentley provided the soundtrack for guests as they explored the newly reimagined flagship location on Melrose Place. "In short, you have new ownership, a new management team, but a very well-thought-of brand that's been around for 13 years," Vice President of Marketing Cory Bronson told attendees. "We've had to in many respects think of how we can not necessarily rebrand ourselves, but revitalize." 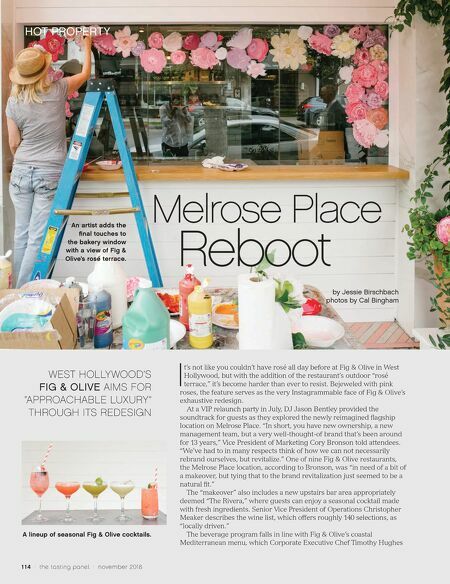 One of nine Fig & Olive restaurants, the Melrose Place location, according to Bronson, was "in need of a bit of a makeover, but tying that to the brand revitalization just seemed to be a natural fit." The "makeover" also includes a new upstairs bar area appropriately deemed "The Rivera," where guests can enjoy a seasonal cocktail made with fresh ingredients. Senior Vice President of Operations Christopher Meaker describes the wine list, which offers roughly 140 selections, as "locally driven." The beverage program falls in line with Fig & Olive's coastal Mediterranean menu, which Corporate Executive Chef Timothy Hughes Melrose Place Reboot An artist adds the final touches to the bakery window with a view of Fig & Olive's rosé terrace. WEST HOLLYWOOD'S FIG & OLIVE AIMS FOR "APPROACHABLE LUXURY" THROUGH ITS REDESIGN by Jessie Birschbach photos by Cal Bingham A lineup of seasonal Fig & Olive cocktails.